Former Pharr Police Chief Ruben Villescas retired September 2017. PHARR — Officials here have agreed to pay a search firm $24,500 to find a police chief to replace Ruben Villescas, who city officials said retired. Villescas’ departure came two months ago, when now-former assistant chief Javier Gonzalez also retired, according to city officials. Commissioners voted Monday to hire Springsted Waters, an executive recruitment company based in the Dallas area. Expanding the search nationwide, the city has a three-month window to recruit and eventually create a profile for candidates to present to commissioners. The contract is good for two years, so if the selected candidate leaves on his or her own, or is terminated before the end of two years, the firm will launch another search, Human Resources Director Anali Alanis said. 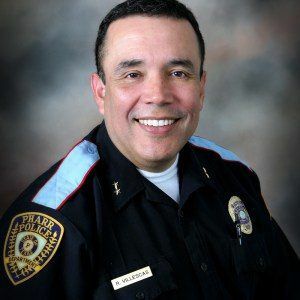 Interim Police Chief Jose A. Luengo, who was appointed Oct. 2 following the departures of Villescas and Gonzalez, said he will likely apply for the permanent position. Luengo has been with the city for 10 years. He was promoted to sergeant in 2013 and to lieutenant in 2015. Villescas was employed with the city since 1982, first as a patrolman before eventually becoming police chief in 2004. Gonzalez was hired in 1985 and became assistant police chief in 2004, two months after Villescas became chief. Both of their retirements were effective immediately.